KUALA LUMPUR: Minister in the Prime Minister’s Department Azalina Othman Said has refused to reveal the detailed expenditure of a visit to the US by Prime Minister Najib Razak and his delegation in September. She said whatever the PM spent on the trip was in accordance with the Members of Parliament (Remuneration) Act 1980 as well as his allowances and perks. “The expenses included the cost of airfare, accommodation, transport, meal allowances, laundry and telephone, among others,” she said in a written reply to Anthony Loke (DAP-Seremban) in the Dewan Rakyat. “Expenditure by the prime minister and members of his delegation follows the rates prescribed from time to time,” she added. Loke asked for the details of the cost of accommodation and the number and class of rooms booked in Trump International Hotel, owned by US President Donald Trump and located near the White House in Washington. Speaking to reporters, Loke said Azalina’s reply appeared to be an attempt to conceal the true costs of the accommodation for Najib and his delegation. According to Loke, room rates at the Trump hotel were very high, with a standard room costing RM20,000 per night. “Apart from the cost factor, the issue is why the prime minister’s delegation chose to stay at Trump International Hotel knowing that it belongs to Trump. “This is not a question of Najib deliberately seeking to curry favour with Trump but an issue of conflict of interest because the American president is prohibited by law from having any personal financial interest related to foreign leaders he meets,” said Loke. 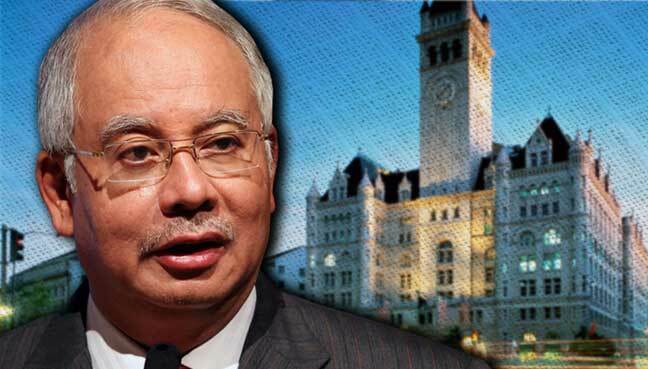 RELATED STORY: Najib’s stay at Trump hotel to curry favour? Loke questioned whether the government was reluctant to reveal the cost of the accommodation because it was unjustifiably high, and could anger Malaysians. He also asked why Najib did not stay at Blair House which was the official accommodation for visiting foreign guests of the US government. “Singapore’s prime minister Lee Hsien Loong, who is currently visiting the US, is staying at Blair House with all costs borne by the US government,” he pointed out. Meanwhile, in a written reply to Lim Lip Eng (DAP-Segambut), Najib said the brief visit to the US should not be measured in terms of investment value as decisions on investments were usually made after several discussions. He said the visit was to take the opportunity to increase the profile and positive perception of Malaysia as a trading and investment partner to the US administration, Congress and businessmen. “Trade and investment were the main topics on the agenda during the visit to the US because it is crucial for Malaysia to have two-way economic communication with the US, the biggest economy in the world,” he said. The prime minister also said the trip to the US was a working visit while the brief visit to Britain that followed was a special visit to British prime minister Theresa May. “Both the visits should not be confused with trade and investment missions,” he added.